The Communist Party USA (CPUSA) is infiltrating the Democratic Party across the country. Communists, some openly, some secretly, are working in Democratic campaigns, holding Democratic Party leadership positions, and even running for public office on the Democratic Party ballot line. The communists also are pushing their policies inside the Democratic Party, to the point that it’s almost impossible to distinguish between the CPUSA and Democratic Party programs. Many comrades also work closely with influential congressmembers or U.S. senators. 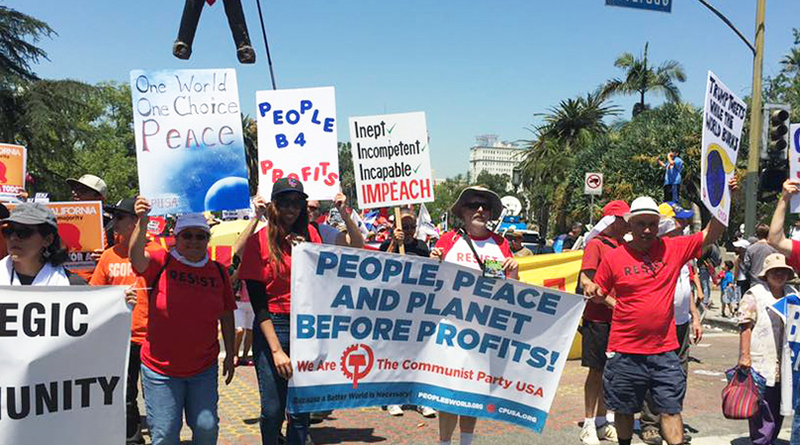 The CPUSA supports China, Cuba, Venezuela, and the Russian Communist Party—all enemies of the United States. The CPUSA still advocates for the “overthrow of the capitalist class” in this country, yet the Democrats do absolutely zilch to keep the communists out of their party. CPUSA infiltration of the Democratic Party is widespread—it effects every region where the communists have a significant presence. In the San Diego area, two CPUSA members, Carl Wood and Emiliana Sparaco, ran this month for the California Democratic Party Central Committee, from Assembly Districts 76 and 80, respectively. Sparaco, a former leader of the Young Communist League, traveled to Sochi, Russia, in October 2017, as part of a U.S. communist delegation to celebrate the 100th anniversary of the Bolshevik Revolution—keynoted by Vladimir Putin himself. In 2018, Sparaco was a leading activist in Flip the 49th, which helped Democrat Mike Levin win California’s 49th Congressional District. In Northern California, Sacramento area Democratic Congressman Ami Bera, who serves on the House Foreign Relations Committee, has won several super-close elections with communist help. For example, in 2014, CPUSA members Juan Lopez, Cassie Lopez, Michelle Kern, Nell Ranta, and Mik Diddams canvassed and phone-banked out of Bera’s campaign headquarters. Further up the left coast in rural Washington state, communists Tim and Joyce Wheeler and Tim’s sister Marion “Honeybee” Wheeler Burns have been active in the Clallam County Democrats for decades. They campaigned for Barack Obama, U.S. Sen. Patty Murray, and local Congressman Derek Kilmer. Tim traveled to international communist gatherings for many years as editor of the CPUSA’s People’s World. His father, Don Wheeler, betrayed American secrets to Moscow during World War II while working for U.S. intelligence. Over in Minnesota, local CPUSA leaders the late Doris and Erwin Marquit were very active inside the Democratic-Farmer-Labor Party (Minnesota’s Democratic Party affiliate). The couple helped raise funds for congressional aspirant Keith Ellison in their home three times. In 2006, they used their political influence to help get Ellison elected to Congress. Another Minnesota communist, Mark Froemke, is very active in the Democratic-Farmer-Labor Party. Froemke has enjoyed good relations with former Minnesota Sen. Al Franken and former Gov. Mark Dayton. Swinging down to Chicago, we see CPUSA members such as Pepe Lozano working in the successful Chuy Garcia for Congress campaign. CPUSA member Abdul-Aziz Hassan has worked for 22nd Ward Alderman Ricardo Munoz, a Democrat, for several years. Even CPUSA leader John Bachtell once served as a precinct chairman for U.S. Senate candidate Obama. In Ohio, former CPUSA chairman Rick Nagin worked inside the Democratic Party for decades. In 2006, Nagin was on the staff of the American Federation of Labor and Congress of Industrial Organizations 2006 campaign that first elected Sherrod Brown. Nagin also worked closely with Congressman Dennis Kucinich for many years. Nagin has run several times for public office on the Democratic Party ticket and served as the Democratic Leader in Cleveland Ward 14 and on the Cuyahoga County Democratic Party Executive Committee. In St. Louis, the CPUSA has worked closely with many black Democratic candidates through its front group the Coalition of Black Trade Unionists. Longtime CPUSA member Glenn Burleigh is very active in the Democratic Party and has managed several Democratic campaigns, including Robin Wright-Jones for State Senate and Lewis Reed for St. Louis mayor. Missouri CPUSA leader Tony Pecinovsky will be standing for St. Louis Alderman in 2020, presumably as a Democrat. Over in New York City, the communists have been working inside the Democratic Party since at least the 1930s. Former communist Dan Margolis was active in New York City elections, including as the mid-Staten Island coordinator for the 2004 Democratic Party congressional campaign. Across the river in New Jersey, communists such as Estevan Nembhard and Carol Widom were active in Democrat Ras Baraka’s successful 2014 campaign for the mayoralty of Newark. Baraka is the son of one-time CPUSA member Amina Baraka. Connecticut is the CPUSA’s “jewel in the crown.” The party almost runs the state. The CPUSA is close to Gov. Ned Lamont, as it was to his predecessor Dannel Malloy. Both U.S. Sen. Richard Blumenthal and Sen. Chris Murphy are close to the party. Sen. Murphy employed CPUSA member Max Goldman as an aide for nearly three years, while serving on the highly sensitive Senate Foreign Relations Committee. Congresswoman Rosa DeLauro is very close to CPUSA Connecticut leader Joelle Fishman and her husband Art Perlo—the son of Roosevelt-era Soviet spy ring leader Victor Perlo. In 2012, DeLauro helped organize birthday celebrations for veteran Connecticut communist Al Marder. Comrade Marder is so well regarded in international communist circles that he was invited to Moscow in June 2015 to help the Russian Communist Party celebrate the anniversary of the Soviet defeat of Nazi Germany. Marder even got a big hug from then-Russian Communist Party leader Gennady Zyuganov. Three other Connecticut congressmembers, Jim Himes (House Intelligence Committee), Joe Courtney (House Armed Services Committee), and John B. Larson work closely with the CPUSA front group Connecticut Alliance for Retired Americans. Even freshman Congressmember Jahana Hayes had veteran communist Len Yannielli working in her campaign office. Down in Texas, the situation is not much better. In Dallas, local communist leader Gene Lantz is very active in the Democratic Party and the Texas Alliance for Retired Americans. Lantz is close to Congresswoman Eddie Bernice Johnson (House Committee on Science, Space, and Technology) and is friends with Congressman Marc Veasey (House Armed Services Committee). In Houston, local CPUSA leader Bernard Sampson doubles as a Democratic Party precinct chairman. The Houston CPUSA ran several comrades for public office in 2018 on the Democratic ticket (it’s illegal to run for office as a communist in Texas). Comrade Ali Khorasani ran for Congress in Texas District 2 but was defeated in the primary. Communist Penny Shaw ran for a seat on the Harris County Commission but lost with 45 percent of the vote. Party member Sema Hernandez ran a shoestring campaign in the Texas U.S. Senate primary and managed to secure a respectable 250,000 votes. And this is just the open or easily identifiable members. As a conspiratorial revolutionary organization, the CPUSA keeps much of its membership secret. The CPUSA almost certainly has many secret members and supporters in key positions throughout the Democratic Party. Millions of grassroots Democrat voters are strongly opposed to communism. Many are descendants of families who fled communism in Eastern Europe, China, Cambodia, Vietnam, and Cuba. Many lost friends or family fighting communism in Vietnam. Many are Catholic, informed of the evils from communism at an early age by their priests, bishops, and popes. Most would be horrified to know that communists are working openly and secretly at every level of their cherished Democratic Party. The Democratic Party knows the identity of most of their communist members. They do nothing about it. They do more than turn a blind eye; they welcome the revolutionaries into their party. The Democrats have spent the last two years bashing President Donald Trump for having ties to Russia. Yet the Democrats are willing to tolerate pro-China communists actively working within their own party. By allowing communists to stand for office on their ticket, Democrats are cheating the American voter. By allowing communists to work closely with Democratic congressmembers and senators, they are endangering national security. Trevor Loudon is an author, filmmaker, and public speaker from New Zealand. For more than 30 years, he has researched radical left, Marxist and terrorist movements and their covert influence on mainstream politics. Views expressed in this article are the opinions of the author and do not necessarily reflect the views of The Epoch Times. You can still get refugee news like this at my new blog—Frauds, Crooks and Criminals!